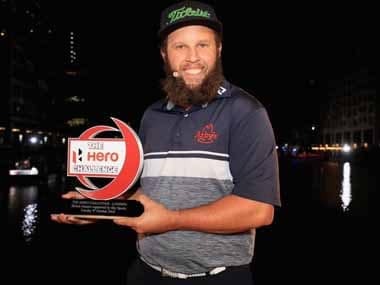 Andrew Johnston sparkled under the lights at Canary Wharf as he won the second Hero Challenge of 2018. The crowd favourite, who signed a whole loads of autographs at the venue, beat back a strong challenge from World No. 2 and tournament host, Justin Rose, defending British Masters champion Paul Dunne, Hero Indian Open winner, Matt Wallace and Danish Ryder Cup heroes skipper Thomas Bjørn and Thorbjørn Olesen. Pawan Munjal, Chairman, Managing Director & CEO of Hero MotoCorp Ltd. presented the now-familiar Hero Challenge trophy to Johnston, who joined Alexander Levy, Lee Westwood, Patrick Reed, Li Haotong and Matt Kuchar as Hero Challenge champions. The crowds chanted in the manner of the Ryder Cup at the South Dock at Canary Wharf, which had the spectacular backdrop of skyscrapers with fans lined the area all around the water making for an electric atmosphere. The players had to find “floating pontoon green’ off a custom built target platform being used as a tee-box. They were split into two groups, with each player having six shots to score as many points as they could. The top two players from each group advanced to the semi-finals. In group one, Johnston made a splash of his first shot, putting it into the water but off his second he scored the first points of the evening as he spun the ball back for 20 points. He failed to score with his final four shots and totalled 20. 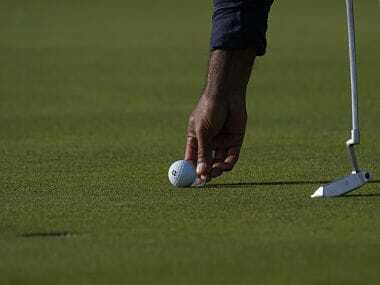 Hero Indian Open 2018 champion, Wallace put the first two shots in water but scored five with the third for his only points. That left Rose an easy target to beat to make the semi-finals. Rose hit what was probably the most spectacular shot off the evening, pitching almost straight into the hole to secure 50 points. He followed that up with a 15 and a 20 and landed yet another shot on the last hit for a whopping total of 90 points. In group two, Ryder Cup captain Bjorn got a massive ovation even though he missed with his first five shots, with his last shot fetching him 20 points. Dunne scored 25 with his second ball and added a ten with the last. Olesen missed his first four shots but he spun his fifth shot back for the second bullseye (50 points) of the night and earned a place in the semi-finals. In the first semi-final, Rose and Dunne missed their first three hits and then Dunne scored ten with his fourth and 20 with his last. Rose shot just 15 and Dunne was through. In the second semi-final, Olesen scored 15 with his opener and Johnston matched it with his fourth shot before the latter scored another 15 with his final ball to advance. Dunne got on the board first in the final, scoring a five with his second ball, but Johnson registered a 20 with his fifth and when Dunne came up short and went into the water with his last shot, Johnston’s final attempt was a mere formality. A thrilled Johnston said, “to do it in front of the home fans is always good. I always get great support wherever I go but London is special because it's my home."